Hehe, look at you so cute. My nephews love dressing up so over the last couple of years Halloween has become a full-on event in our family and my Nan has started throwing rather spectacular parties. Her whole neighbourhood goes crazy for it (it's a very family filled place) so it's trick or treating on Sunday night for us! To be honest, I think i'm more excited than the boys. Bring on the sweets. ha ha, i love the look in your eye! i wish we did celebrate halloween here but i guess being spring, it's just not quite the same. OMG This melts my heart... Being Australian and now living in LA I'm totally experiencing the opposite! I love little you! What a great picture, you all look like your exciting and having fun!! My kids love Halloween and this is our 4th year of celebrating it ... My kids are very excited! That picture is spectacular! I love your lack of teeth and wild eyes. Love that picture and i remember like it was yesterday how the 3 of you ran from house to house every year!!!! That's you without the front teeth? ADORABLE. p.s. nice blue eyeshadow. class-say. Where my parents live in Broome WA, Halloween is huge! My brother and sisters have been invited to a stack of parties and trick or treating events. The more celebrations the better I say! happy halloween...i saw orange pumpkins at the market for $35.00 and almost passed out. smile. 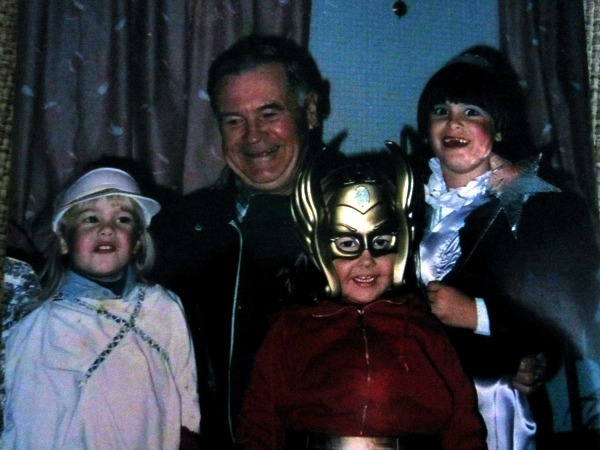 Awesome picture, it made me laugh for a good 2 minutes :) I love your missing teeth and your sister's wonder woman costume... Happy halloween !! Just BOOtiful!Don't you love those old photos? Having done my own fair share of 'trick-or-treating' as a child in North America and now living in a country that does not celebrate that "SPOOKfest", I understand your melancholy about it. I'm grateful that the International School my children attended put on a FANGtastic Halloween celebration every year and even though there was no door-to-door treat collecting, they at least experienced some of that spooktacular fun and excitement. Just like you, nostalgia inspired me to post some photos too. Happy Halloween to the little girl with her silver star wand! ok, this is gonna sound totally crazy, but I swear you are my childhood look alike! no kidding! that photo looks like me as a kid- I had those same bangs!